“In the course of a recent research through some old records, the name of another of Hongkong’s pioneer firms was noticed, that of Gibb, Livingston and Company, who came here in the first year of the Colony’s foundation. The firm can indeed claim to be one of the oldest in this part of the world, at they commenced business in Canton [on 1st July] 1836, being established by [two Scotsmen, Thomas Augustus Gibb and William Potter Livingston, who were originally employees of the British East India Company and moved to Macao during the First Opium War], and soon developed into one of the biggest concerns engaging in miscellaneous trade in the Far East. Operations were extended to Macao, and in 1839 the company was granted permission to engage in the importation of opium to the Portuguese colony. In 1841, on the founding of Hongkong as a British possession, Gibb, Livingston and Company came over here, erecting premises on a site off Queen’s Road just below Gough Street; and have been in the forefront of local mercantile operations ever since, with a particular development along the lines of shipping and insurance. The company was made a limited liability concern in 1920. In 1845 we find the following principals and others in the firm – Thomas A. Gibb, W. Potter Livingston, Joseph G. Livingston, J. Skinner, Thomas Jones, George Gibb, W.H. Warley, and J.D. Gibb. Messrs. George and J.D. Gibb were at the Shanghai office, Mr. Thomas Gibb at Canton, and Mr W.P. Livingston represented the interests in London, the remainder being out in Hongkong. The firm’s address was given at this period as Aberdeen Street, which had by then been named. Messrs, T.A Gibb and W.P Livingston were among the first Justices of the Peace ever appointed here, in 1843. Mr T.A. Gibb is mentioned in several of the old records as a leader in various activities of the merchants of his time; and Mr W.P. Livingstone was also frequently consulted by the Governor, Sir Henry Pottinger, in 1843, as a member of the representative Committee of British merchants formed that year for the better liaison work of business and official interests. By 1869 the principals were T.A. Gibb (in England), John D. Gibb and H.B. Gibb in Hongkong and E.F. Duncanson (in Shanghai). A large staff of assistants were then employed at the local office, still situated in Aberdeen Street. Mr H.B Gibb became a member of the legislative Council in the late Sixties, and was a prominent figure throughout the Seventies in the Colony’s affairs. Mr J.D. Gibb was one of the Colony’s unofficial Justices of the Peace in the Fifties and throughout the Sixties was in the forefront of commercial and public activities being one of original trustees of the old Sailors’ Home, which was founded in 1862. W.H. 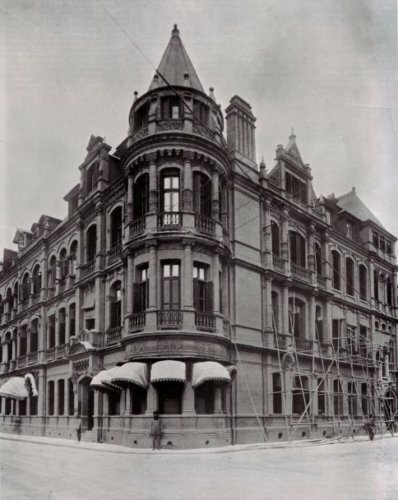 Gibb, one of the assistants, had become a principal by 1864; and besides Canton and Shanghai the firm had now branched out at Foochow [Fuzhou mainly for the tea trade and from which the firm’s clippers operated], Hankow and Kiukiang. The Aberdeen Street premises continued in use for a considerable time longer, and it was only the Praya reclamation that prompted the firm, as with others of the period to move outward towards the seafront.” (1) Additional information in square brackets comes from (2). “Its office in Hong Kong was located at the York’s Buildings and in 1855 it’s senior partner Hugh Gibb, who was later chairman of the Hong Kong General Chamber of Commerce and a member of the Legislative Council of Hong Kong. The principal trade of the firm in its early days were export of tea and imports of cottons and woolens as well as trade in opium. The firm was the agent for many companies in different places in China including Shanghai Land Investment Company, China Fire Insurance Company, North British and Mercantile Fire Insurance Company, “Allianz” Vers. Aktien Ges. in Berlin, United States Lloyds, Indemnity Mutual Marine Insurance Company, Lloyds London, London Salvage Association, Liverpool Salvage Association, Maritime Insurance Company, Ltd., Liverpool, Underwriting and Agency Association, and; British North Borneo Government, Hongkong Electric Company, South African Line of Steamers, Australian Alliance Association Company (Marine), Northern Fire and Life Assurance Company and North Queensland Insurance Company in Hong Kong; and Union Insurance Society of Canton, Peninsular and Oriental Steam Navigation Company, and North British and Mercantile Insurance Company in Foochow. 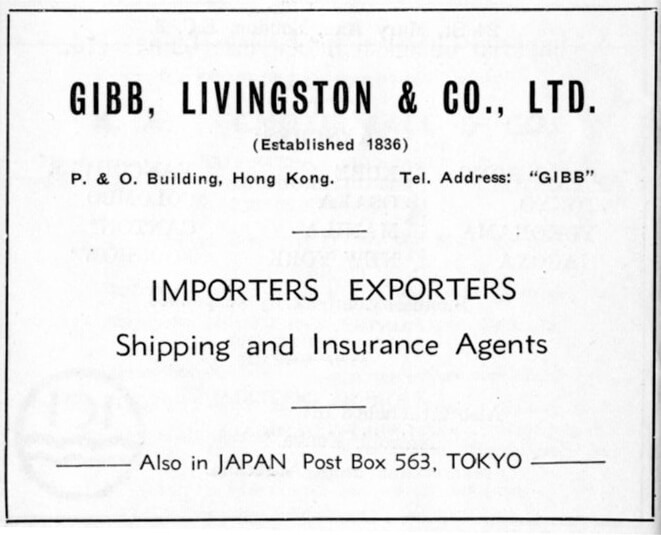 Gibb, Livingston & Co was also the agent for the Ben Line of Steamers and the Eastern and Australian Steamship Company in Shanghai, Hong Kong, and Foochow. This article was first posted on 27th February 2017. Old Colonial articles online This article was posted in Old Colonial a series of articles written by Vincent Jarrett for the SCMP 1933-1935 covering the history of Hong Kong.